BILT Explorer Adventure Suit review - - DESTRUCTO TESTED! 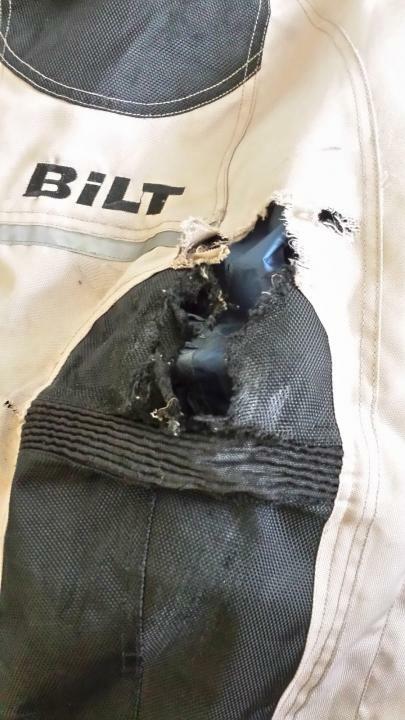 RidingGearApparel BILT Explorer Adventure Suit review - - DESTRUCTO TESTED! 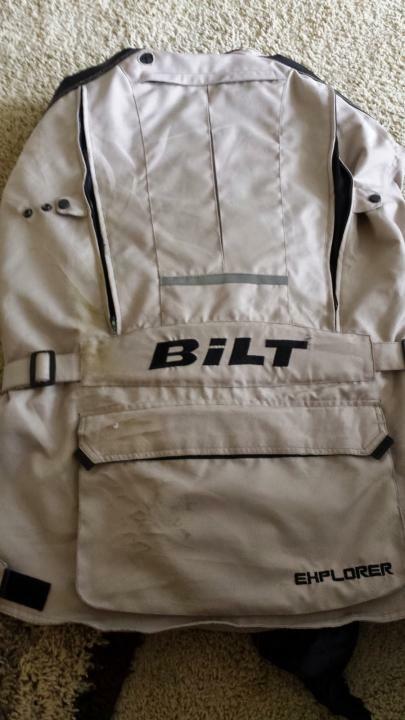 I purchased a BILT Explorer Adventure suit from my local Cycle Gear in early 2014. This was my first rally style riding suit purchase. I made it based on price, comfort and convenience, in that order. In hindsight, I didn't look at build quality, armor and proper fitment. This is a lesson learned. 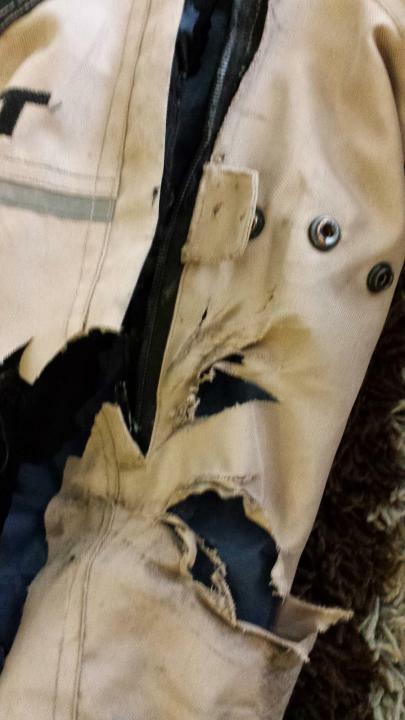 I destroyed this suit in June of 2014, in Seattle, on the I-5, in rush hour traffic. A car swerved left into my lane, hit me square on the aluminum pannier and vaulted me forward. I had two hard impacts and tumbled as far as you can go at 55 MPH. The Explorer suit had to be cut off of me because they feared trauma and other injuries. I was very lucky to avoid anything terrible happening to me. But this is about riding gear, so let's get to it. First, let's talk about seams. The basics are PLAIN, FRENCH and FLAT. I wont bore you here with the details, search them on your favorite wiki for more information. To sum it up, PLAIN is what you will find on your t-shirts. Usually a single stitch with a fold. FRENCH is where you overlap the fabric and double stitch the seam. FLAT is where you fold two pieces apart then join them with a stitch. FRENCH is going to be the most durable and have the most chances of saving your flesh. Let me mention the material. The 600-1200 denier fabric is what is referred to as ballistic nylon. The number refers to the weight of the nylon thread and the weave. It does not correlate to the strength of the fabric. This stuff is not kevlar so do not be fooled into thinking it won’t melt under a tumbling situation. The pictures show that the seams on the BILT product held together very well. It is chock full of PLAIN seams and even though I didn't find many FRENCH seams, I also didn't have anything part/rip or tear away at a seam. 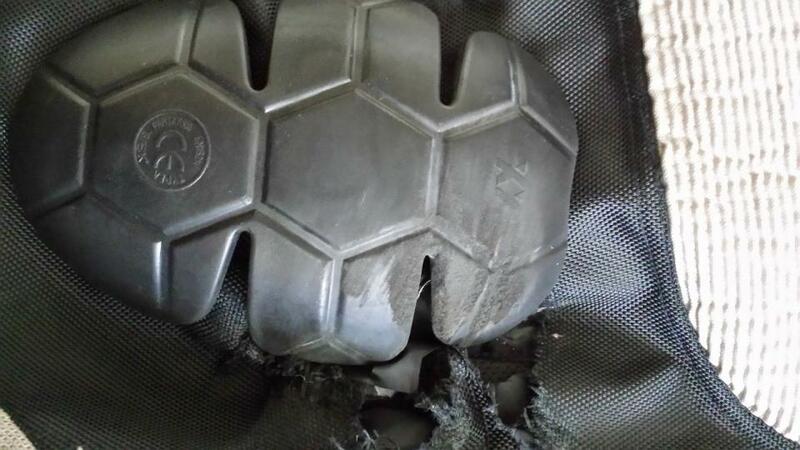 What did happen was the nylon fabric of the shell started to melt during the road abrasion part of the accident. It literally folded in on itself and ‘wear burned’ into small strips. The padding and armor worked but, had a few setbacks that I would want to avoid in the future (as if I plan these things). The elbow armor and knee armor is nothing more than a foam vinyl or nylon pad. The knee wells and elbow wells for the pads had a lot of wiggle room and when tested, this proved to provide no protection at all. The pads stayed in place for the initial impact. Once the prolonged contact with the asphalt and subsequent tumbling began, the pads moved. One moved inside and the other outside of my knees. This left my kneecaps to be protected only by the nylon shell, which promptly burned away under abrasion. The elbow pads pushed up and outwards, but the edges stayed in place to give some protection. Since gloves and a helmet came with the suit, I am going to mention them here. My hands got some friction transfer from the initial impact. I got a bruise, some outer palm abrasion and a broken metacarpal. The gloves showed minimal damage and were still in good condition. 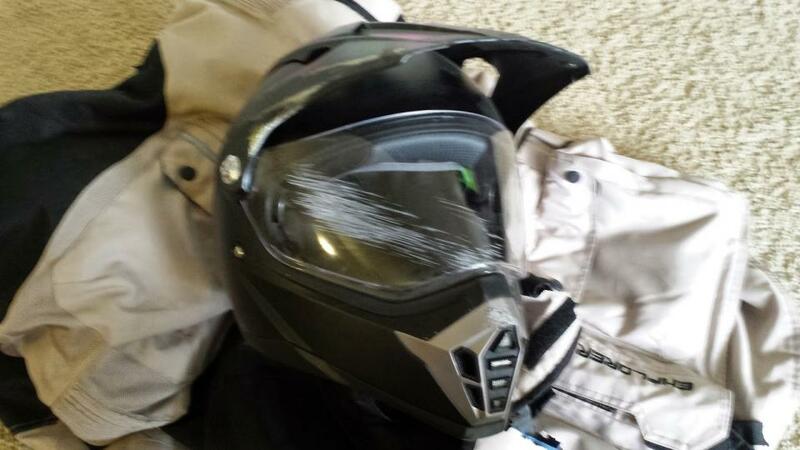 The helmet spent some time on one side grinding on the I-5 and looked fairly effed up. It did its job and I am glad it didn’t fall apart. 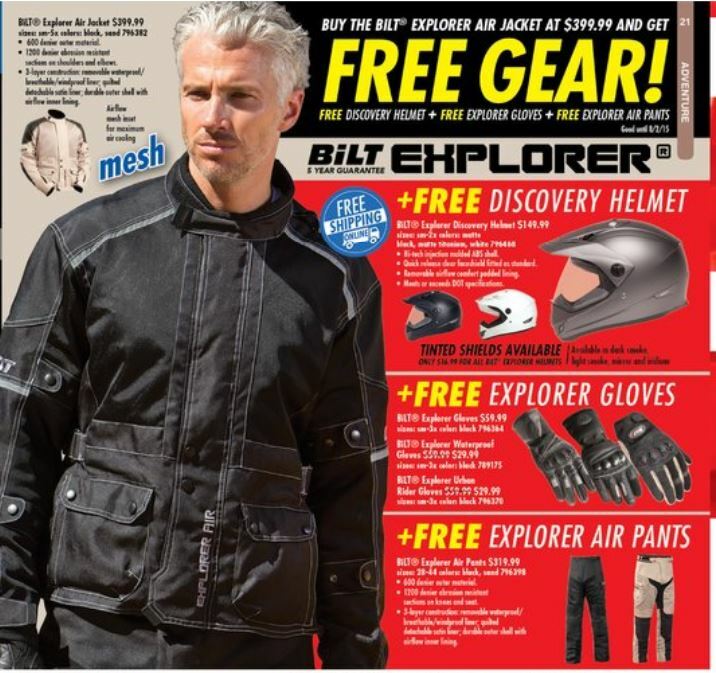 That last line sums up the entire BILT Explorer Adventure Suit. It did it’s job and I am glad it did not fall apart. Would I buy another? No. Would I recommend this to someone? Yes, if you were on a budget, because it is a lot better than jeans and a textile jacket in an accident. When I went looking for my next suit, I looked at two brands. BMW Rally and KLIM Badlands. The build quality of these two brands are fantastic. The armor is superior and the fit of the suit is incredible… for a 6 foot 2 inch tall, 225 pound galoot. This last photo shows the rear of the jacket. You can see where I tumbled and slid briefly. Very minimal damage here. I hope this gives someone a bit of insight if they are in the process of deciding “Do I want a $300 off the rack, foam armor, four size choice for a riding suit.” or “Do I want an $1100, fitted riding suit with quality fabrics, abrasion zones, impact armor and a warranty.” In this case, you get exactly what you pay for. Awesome review and pictures, also good summary on it's better than nothing if you are on a budget. A step in the middle for quality/price point might be Olympia, First Gear, or new Icon Rayden offerings. Thanks NavyNuke, the Icon Raiden gear looks great. If I had seen that jacket and pants combo while shopping it would have been a contender. It had the type of impact armor that I prefer and the quality looks very good. I was wearing Icon Field Armor Chukka boots when I crashed. They took a good beating and only required a replacement strap. They are superb boots, I still use them. I still have my original, 15 year old TourMaster adventure jacket. It didn't come with any armor but it is the best cold weather, family vacation jacket I have ever owned. I've had very good luck with Olympia Jackets, pants I'm all hit and miss, sizing is an issue for me(need to get more time at the gym). I have a pair of AGV kevlar cargo's that are pretty good slide protection, add armor as needed to your body to keep from moving it around. I'm hoping to try on some of the Raiden pants when i get back in the U.S. in a few weeks. I have an old Thor jacket that is of similar nature to your TourMaster one. Served me well in Alaska last winter for work! It would be great if you could add this in our review system. Let me know if you need to know how to do that. FYI , this is the similar deal when I got my gear. Jacket, Pants, Helmet and Gloves for basically the price of the jacket.